The Drexel University men’s and women’s swimming and diving teams competed against Georgetown University Jan. 19 at the Daskalakis Athletic Center. The Dragons celebrated their last home meet of the season which doubled as a way to honor the seniors on the team. The men’s and women’s teams finished with 11 first-place finishes each. The men’s team set three new pool records against Georgetown. The men’s team has been virtually unstoppable this season only falling to La Salle University back at the beginning of this season and the University of North Carolina at the Patriot Invitational Nov. 15-17, 2018. Since then, the teams have defeated Northeastern University, the University of Delaware and Towson University — all of whom are members of the Colonial Athletic Association. Georgetown had suffered a loss to Towson at the beginning of their season, so it was looking like it would be a good day for the Dragons and they delivered wins from both teams. The women defeated Georgetown 169-125, while the men came out on top 176-112. The day began with the women’s and men’s 200-yard medley relays. In both events, the Dragons came away with the win. The women were up first and won with a time of 1:43.62. This team was made up of juniors Alexa Kutch, Hollie Hopf and Alicia Diaz, and sophomore Gabrielle Rudy. The women beat the fastest Georgetown relay team by almost seven seconds. The men’s team won with a time of 1:31.51 setting a new pool record from the one back in 2015. This team was made up of sophomore Kiran Richardson, senior Ralph Cannarozzi III, freshman Paris Raptis and junior Jason Arthur. In the 1000-yard freestyle events, Georgetown was victorious. In the women’s event, Nina Barrett won the event for Georgetown with a time of 10:28.12. This was just over 13 seconds ahead of her teammate Noelle Fimbres and 15 seconds ahead of Drexel junior Dora Gercsak. Senior Dane Bell had one of his final swims at home in this event; he placed second for the Dragons. The women took the top two spots in the 200-yard free event. Senior Charlotte Myers won with a time of 1:55.74, followed by freshman Jordan Washart 0.42 seconds later. In the men’s 200-yard free, junior Stathis Malamas took first place with a time of 1:41.20 which was only 0.29 seconds ahead of senior Patrick Cobb. Richardson came in third place for the Dragon sweep. Another one-two for the women occurred in the 100-yard backstroke. Kutch took another win for her career with a time over a second ahead of Diaz. She was also over three seconds ahead of the closest Georgetown competitor Alex Rieker. Arthur took the win for the men in the 200-yard back in a time of 50.37. He beat Georgetown’s Drew Carbone by just over a second. Drexel sophomore Rhys Kawaguchi placed third. The Dragons swept the 100-yard breaststroke events. Both events were very exciting as the top two finishers battled each other all the way to the wall. Freshman Megan Sicinski has had an incredible first season with the Dragons so far and she capitalized against Georgetown in this event. She came in first with a time of 1:06.29. She was followed by teammate seniors Rebecca Churchill and Sarah Cahill. First and second place for the men’s 100-yard breast were separated by only 0.03 seconds. Cannarozzi bested senior Harrison Schultz for the top two, and senior Joseph Brown took third place about a second-and-a-half behind them. The Dragons won the top spots for the women’s and men’s 200-yard butterfly events. For the women, senior April Forsthoffer took first over four seconds ahead of her Georgetown competitors, and Raptis had a similar fate in the men’s event. Raptis beat Georgetown’s Brett Sherman by over six seconds setting a new pool record of 1:48.91. In the 50-yard free events, Rudy won the women’s event with a time of 24.29. Hopf came in third with a time of 24.76. On the men’s side, the Dragons swept the 50-yard free. Richardson came in first, freshman John Scully in second and junior David Kneiss came in third. Moving on to the first diving events, freshman Becca Demaree came in second place in the women’s 1-meter dive behind Georgetown’s Riley Fujioka. In the 100-yard freestyle, the Drexel women swept the event while the men went one-two. On the women’s side, freshman Paige Powell took first place with a time of 53.65 seconds. Rudy was behind her in second and senior Niki Fistrovic came in third. Powell led the race the entire time even though Rudy actually swam a faster second half of the race. In the men’s 100-yard free, Malamas came in first with a time of 46.64 and senior Luke Hanner came in second. 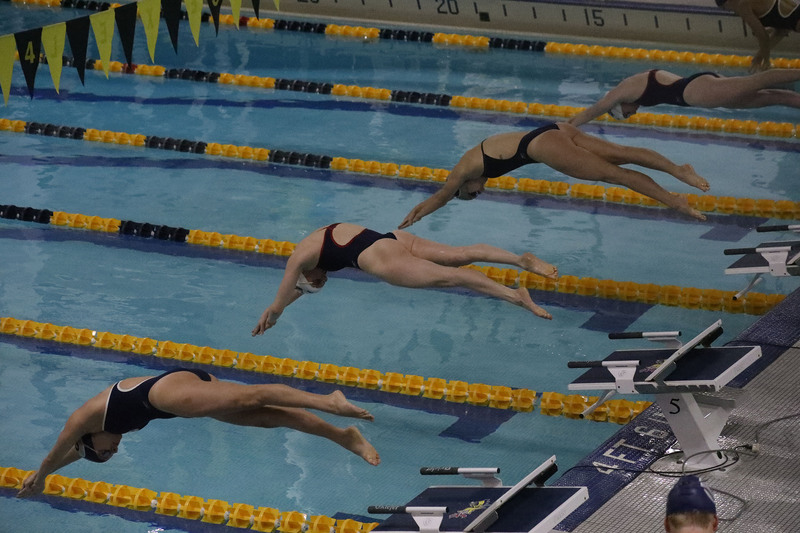 The Drexel women claimed the top two spots in the 200-yard backstroke. Kutch dominated again with a time of 2:05.25 with Diaz in second. Kutch led the field for the race with the fastest splits for the first three laps. On the fourth, Diaz looked like she was gaining but ultimately lost by just over a second. On the men’s side, Arthur took first place with a time of 1:49.13, and junior Spencer Hill took third. Arthur led the field by a full body length by the end of the race. In the 200-yard breaststroke, the Drexel women swept again! Sicinski took the first spot with a time of 2:22.60, which was over five seconds ahead of her closest competitor. In second place was Churchill and in third place was freshman Corinne McCurley. Sophomore Zachary Valenzuela took second and Brown took third place for the men; both falling to Georgetown’s Carlson Temple. Washart took second place in the women’s 500-yard free while the men swept the 500-yard free. Cobb, Hanner and Bell went one-two-three, respectively. In the 100-yard butterfly, Myers and Forsthoffer came in first and second for the Dragons only separated by 0.48 seconds. Raptis and junior Joe Short were also first and second for the men but separated by about a second. Demaree placed second for the women’s diving team in the 3-meter dive. Junior Anthony Musciano scored more than 40 points ahead of his competitors in the men’s 1-meter dive. For the 200-yard individual medleys and the 200-yard freestyle relays, the Drexel times did not count towards the points totals. However, the men’s team made up of Richardson, Kneiss, Malamas and Scully set a new pool record of 1:22.91 in the 200-yard freestyle relays. This was a fantastic final win for the seniors at their home pool. The Dragons now look ahead to preparations for the 2019 CAA Swimming and Diving Championships which will be held Feb. 20-23 at the Christiansburg Aquatic Center in Virginia. The toughest competitors for the Dragons will be the reigning champions from last year — the James Madison University women and the College of William & Mary men. The Dragons have not seen these teams yet this season, but they are more than up for the challenge of earning the conference title.